If you like to play more than one hand at a time, when you play video poker, triple play is a good option. Here, we have a totally free triple play poker to play. You can choose from lots of variations of the game, so you get the game you want and play three hands at a time. Within online casino entertainment options, video poker has risen to the highest of levels in recent years. Initially viewed as an alternative to slots, video pokers are now counting on their own followers and multiple variations to the basic poker games. Triple Play Poker stands out from the crowd as it allows the gamers to use their skills to beat the house over multiple hands at the same time. Play three hands at once with bets of up to several coins per hand and experience different variations of video poker in one package; IGT’s hugely popular version of Triple Play Poker plays like a single game with up to 9 options - 9 different video poker games, including Jacks or Better, Double Bonus, Deuces Wild and Joker Poker. Triple Play Poker boasts easy gameplay, and that’s why both inexperienced poker lovers and seasoned bettors can play it. Getting to know the interface won’t take more than half a minute, as you just have to spot the buttons below the main gameplay screen. These buttons allow you to change bet size, the speed of the game, as well as the specific video poker game you are playing. Of course, appropriate buttons will give you an insight into game rules and pay-tables. The player decides free-willingly to switch between games whenever he or she desires, having in mind that all of them have one thing in common - exactly three hands are played at a time. Once you click on the Deal button, the initial set of five cards will be dealt to you by the software, all face-up. This is the point where you decide which cards you wish to hold. You can mark the cards you wish to keep an a variety of ways, either by clicking on them or pressing the corresponding keys on your keyboard; in the same way, to unselect a card, simply repeat the action once again. Now that you’ve chosen the cards and your decision is locked in, click the Draw button and observe the three hands play out. Three different draws from three different decks will follow. Any payouts will be carried out automatically and the game will offer you a chance to move on to the next hand. One has to pay for all three hands, which will eventually be scored individually. 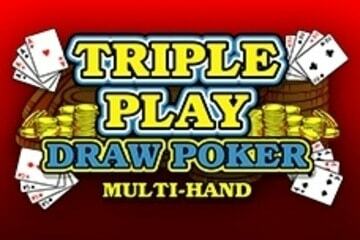 In Triple Play Poker, the player stands a chance to win up to three times on every round. What More is There to Know About Triple Play Poker? On the example of Triple Play (Draw) Poker from IGT, we can see how this format is considered a complete video poker solution. There are 9 variants within the game in total, namely Jacks or Better, Bonus Poker, Bonus Poker Deluxe, Double Bonus, Double Double Bonus, Triple Double Bonus, Deuces Wild, Deuces Wild Bonus and Joker Poker. The range of available variants is quite accommodating; as you can see, video poker can be played online in triple-play style within a basic format where all you need to win a prize is a pair of jacks (Jacks or Better), but you can also make the game more complex and swingy by opting for Triple Double Bonus where Four of a Kind will pay out as much as a Royal Flush.